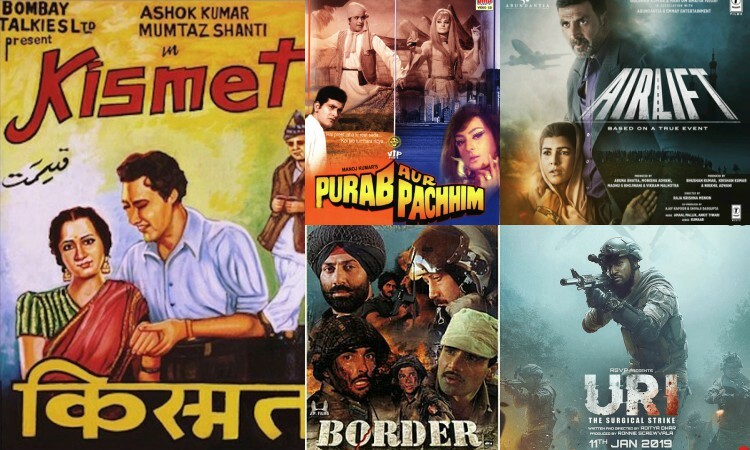 From "Kismet" in 1943 to "Purab Aur Paschim" in 1970 to "Border" in 1997 to "Airlift" in 2016 and now "Uri: The Surgical Strike" -- Indian filmmakers have been attempting to evoke nationalism among citizens for decades altogether. Only the treatment and subjects have evolved. While films in the pre-Independence period were mainly about fighting colonialism, contemporary cinema is themed on combating terrorism, celebrating the country's glorious achievements and talking about social issues. Filmmaker Omung Kumar B. told IANS: "Cinema has played a key role in defining the idea of India. Soon after Independence, we saw an era of films that spoke of the idea of India, then came movies like 'Mother India', 'Roti, Kapda aur Makaan' that defined the challenges we faced as a nation. "Then came the 'angry young man' in megastar Amitabh Bachchan who fought the social barriers in the 1980s. The manner in which we grew in the nineties reflected in how our films started becoming more urban and related to urban issues. But throughout our cinematic history, our soldiers have been given the place of honor they deserve. " In Bollywood, Army-based films like "Border", "LOC Kargil", "Lakshya" and "1971" have worked. But with changing time, filmmakers realized that there is more to explore. In 2001, director Ashutosh Gowariker made Aamir Khan-starrer "Lagaan: Once Upon A Time in India", in which a group of villagers fight the Britishers for tax reduction via a cricket match. The film set a trend of sports films in the industry. Mumbai-based film historian SMM Ausaja notes: "Nationalism has been always there in Indian cinema but now the treatment has changed. 'Lagaan' was an intelligent piece of patriotism. The way the director incorporated sports in the storyline of British Raj was way too commendable." After "Lagaan...", several sports-based films like "Chak De! India", "Bhaag Milkha Bhaag", "Mary Kom", "Soorma" and "Gold" fueled up the audience with inspiration. Ausaja said "Dangal" is an important film for nation-building. "It revolves around the Haryana girls and their achievements. Such films depict the true meaning of nationalism as it will encourage more girls to participate in sports and remove the barrier of gender inequality," he added. In 2004, superstar Shah Rukh Khan starrer "Swades" too redefined the sense of nationalism in Bollywood. The film saw the superstar play an NRI who comes back to his roots and tries to improve the conditions of villagers. Two years later, Rakeysh Omprakash Mehra made "Rang De Basanti", a cult film which depicted the problems of today's generation. Actress Sagarika Ghatge of "Chak De..." fame hailed the change of portrayal of nationalism in Indian films. She said: "In 'Chak De...', the protagonists were all girls. Now with more patriotic films coming out, we see more of actresses standing out as leads... Women are leading the industry. 'Chak De India' was a great film, it still is. I am glad I was a part of it." Alia Bhatt's "Raazi" is the latest example too, as is Kangana Ranaut's "Manikarnika - The Queen of Jhansi". Earlier, films used to focus more on strong patriotic dialogues, songs, and jingoism, but with "Raazi", the makers tried to portray that patriotism is more than jingoism. During the promotions of the "Raazi", Alia had earlier said: "I learned that what we believe is patriotism is quite opposite of what true patriotism is. We say we are patriots because we are living in the country and we love our country, but that is not enough. "You know you don't need to express your opinion all the time. You can feel for things and take action to solve a problem, instead of talking about the problem. Action speaks louder than words." Actress Yami Gautam, who is on roll with the success of her latest film "Uri..."-- based on the 2016 surgical strikes that India conducted following a terrorist attack in Uri in Jammu and Kashmir, said: "A fair balance should be maintained between patriotism and jingoism in movies". With the rise of content-driven cinema in India, stars find it more important to do patriotic and nationalistic films for the growth of the nation. Actor John Abraham is known as the modern patriot of Bollywood. He has featured in several patriotic films like "Madras Cafe", "Parmanu: The Story of Pokhran" and "Satyamev Jayate". In his upcoming films "RAW" and "Batla House", wears his patriotism on his sleeve. Akshay Kumar's recent filmography includes titles like "Gold", "Rustom", "Baby", "Holiday: A Soldier Is Never Off Duty" and "Airlift", all stoked in patriotic fervor. But even he has tried to bring a change with films like "Padman" and "Toilet: Ek Prem Katha", which promote nation-building.